Our most recent Annual Report gives information about all our services and activities in the last year. Click on the images below to read the reports. or happy is one example (dictionary definition) – these are broad, far reaching, fleeting descriptions for most of us, but how does this all fit within the context of harsh asylum and immigration policy, and service delivery? 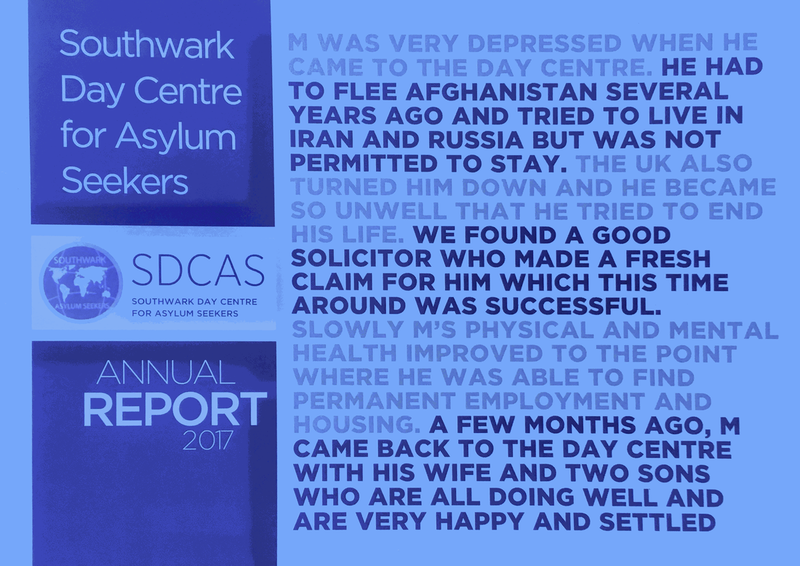 This report should be considered within the context of an ever changing and often hostile asylum and immigration environment - and within the context of the holistic work of Southwark Day Centre for Asylum Seekers (SDCAS) which seeks to promote equality rather than dehumanising, stimatising or restricting asylum seekers and refugees from being part of society in a meaningful way and supporting people to build resilience throughout the asylum process.The research set out to explore the clients views and understandings of the effectiveness of the advocacy and advice service of SDCAS and thus to provide evidence of the impact of the services offered on the clients. The research adopted a qualitative methodology and also used some volunteers/clients as co-researchers. The findings of the research demonstrate that the centre’s provision in relation to advice and advocacy is much valued by clients not just in relation to the services provided but also because of the strong ethos of SDCAS which enables clients to feel welcome and valued.